There is a new update to Snapseed for Android available in the Play Store that brings a few but nice improvements to the photo editing app. The update is version 2.6 for those keeping score at home and if you have the app already installed on your phone or tablet, you should get the OTA update in the next few days. 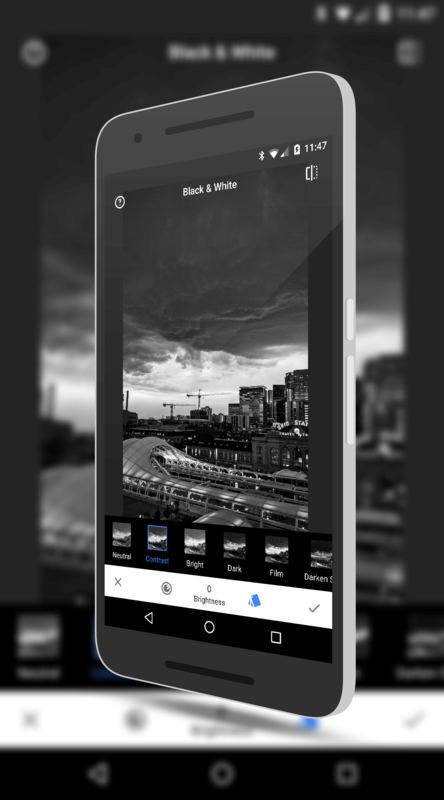 The first change is the addition of a blue filter to the Black and White filter of the app. This allows you to create high contrast B&W images by ramping up the blue while toning down the yellow. You don’t see the colors obviously in the black and white image but the effect creates the high contrast for your photo. white balance so you can manually adjust it or select from 8 preset settings for Daylight, Tungsten, Sunny and the like. Both of these features have been commonly requested features of Snapseed and it is good to the Google team (who owns the app) to listen to users and get them added. There are the normal updates and fixes to the app that are not documented in addition to these filter changes so even if the filters aren’t a big deal to you, it’s a good idea to get the latest-and-greatest to assure you don’t run into bugs. If you haven’t tried Snapseed, give it a try. It is a simple but powerful editing app for your photos and is on my list of must-have apps for Android users.